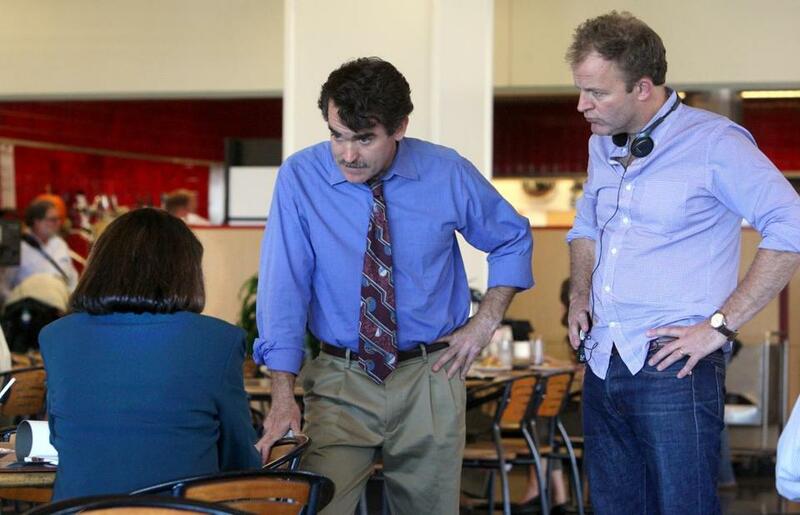 From left: Maureen Keiller (back to camera), Brian d’Arcy James, and director Tom McCarthy during filming of “Spotlight’’ at the Globe. From left: Michael Keaton and Mark Ruffalo at the Globe. 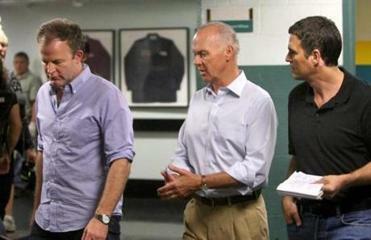 Director Tom McCarthy filmed more of the movie “Spotlight” at the Globe’s offices in Dorchester over the weekend. The film, which shot a scene at Fenway Park on Thursday, is about the Globe’s investigation of the Catholic Church abuse scandal. Actors at the paper on Saturday included Michael Keaton, who’s become a doppelganger of Globe Spotlight editor Walter Robinson; Mark Ruffalo, who’s playing Michael Rezendes; Tony-nominated actor Brian d’Arcy James, who’s playing reporter Matt Carroll; and Maureen Keiller, who’s playing longtime Globe columnist Eileen McNamara. Keiller has a long local resume that includes Frances McDormand’s “Olive Kitteridge,” which was filmed on the North Shore and airs on HBO in November. “Ray Donovan” star Liev Schreiber, who plays former Boston Globe editor Marty Baron in “Spotlight,” is also in town for the shoot. So is Stanley Tucci, who plays lawyer Mitchell Garabedian. Tucci, of “The Hunger Games” and “Julie & Julia,” was spotted last week at the Institute of Contemporary Art and at Strega Waterfront. . . . In other local film news, “Ted 2” had a wrap party at Bond at the Langham Hotel on Sunday. Guests included director and voice-of-Ted Seth MacFarlane; actress Amanda Seyfried, who stars opposite Mark Wahlberg in the comedy sequel; and Seyfried’s boyfriend, actor Justin Long.